On celebration of Joomladay Bangkok 2011 - a huge Joomla community networking chance, JoomlArt rolls out special 50% OFF promotion program applicable on all JA Joomla products. For all of you who do client works or need great looking ready made designs, We have some special coupons for you. 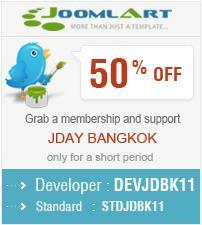 50% OFF on JoomlArt.com template memberships for a very limited time period only. With a membership you have full access to over 100 top-notch designed Joomla templates and superior technical support.